Nightmare room: Eve Allin reviews Daniel Bailey’s surreal production of Joe Penhall’s dissection of systemic racism in the mental health care system. Blue/Orange by Joe Penhall echoes loudly in the Birmingham REP’s House theatre. It’s the biggest theatre I’ve ever reviewed in. The slow burn intensity of Penhall’s script is magnified and stretched out in the space. Amelia Hankin’s set is skewed – offset at all angles and oddly spaced. There is almost too much space here; the chairs sit so low to the ground and a potted plant is placed at the very corner of the space. The hues are blue and orange (naturally), but what catches my eye and fixates me are the double doors which are placed at a distance, as if they round off a long corridor. The surrealism of this decision makes the whole thing feel like a David Lynch still frame. Ivan Oyik plays a jittery Christopher, locked somewhere he shouldn’t be and desperate to get out. He wears the same grey hoodie from that infamous Get Out still, and in the interludes between scenes Daniel Bailey directs almost a homage to that film and highlights the idea of a surrealist black experience. The stage itself is vast, but we are drawn into a tiny window through which we see three bodies – two white and one black, playing and shifting around each other. This production is aware of its own theatricality in a way that sometimes means the images feel a little too neat. Actors direct monologues out to the audience, looking for a reaction, and the stage images are held just a second too long sometimes. Although in a way, this only exacerbates the theatricality of Christopher’s situation – he is surrounded by two doctors who seem to speak in an unintelligible jargon. 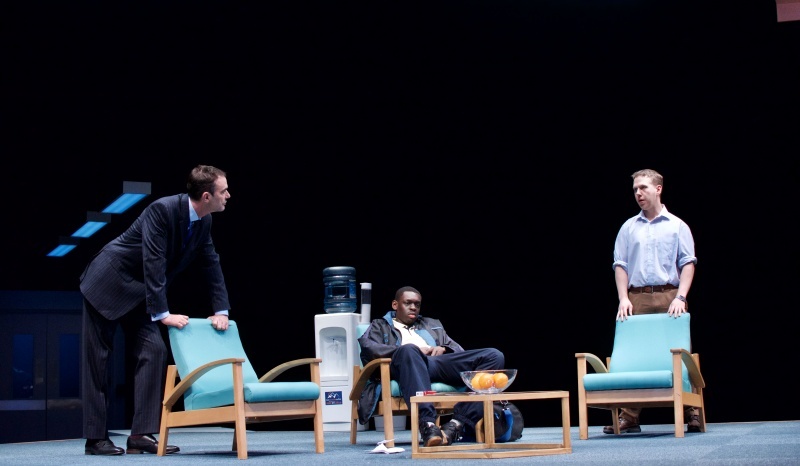 The titular blue orange is framed within the play as an analogy that’s called into question; a slippery metaphor handed gift wrapped to the audience. Blue/Orange takes place in an interim – nothing actually happens, people just talk about things happening. That is so much of what being in the throes of the mental health system entails, I think. Discussion is everything and circular conversations are the crux of the solution. Penhall’s text slips through our fingers – each time I think I’ve grasped it, it makes a new turn and pulls the rug out a little more. So much of the language of the play is insidiously colonial – 20 years on and the institutional racism of the system is more prevalent than ever in the slips of the tongue and unconscious biases. Yet, some of the decisions in the script do feel a bit dated. It is the two white doctors who have the most stage time, and the biggest character arcs. Perhaps I am reading too much into it but there is something nagging at me about the politics of it all. Undoubtedly the show is important, and exposes the weirdness and discrimination of the psychiatric industry, but it left me feeling a bit unsure. Perhaps it was the vastness of the theatre – I felt like I wanted to be up close to the characters, so close I could see the sweat on their brows. The play digs into you over the two hours, but the claws slipped out a little because of the grandeur of the stage it was on. Blue/Orange is at Birmingham REP until 16th February. More info here.